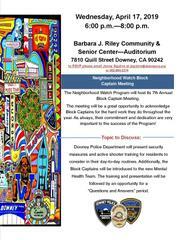 The Neighborhood Watch Program will host its 7th Annual Block Captain Meeting. The meeting will be a great opportunity to acknowledge Block Captains for the hard work they do throughout the year. As always, their commitment and dedication are very important to the success of the Program! Downey Police Department will present security measures and active shooter training for residents to consider in their day-to-day routines. Additionally, the Block Captains will be introduced to the new Mental Health Team. The training and presentation will be followed by an opportunity for a “Questions and Answers” period. to RSVP please email Jenny Aguirre at jaguirre@downeyca.org or 562-904-2374.